Former two-division UFC champion Conor McGregor has once again taken aim at current lightweight title holder Khabib Nurmagomedov. In his most recent effort, McGregor posted photos of Khabib and his wife, where he referred to the latter as a towel. Check out Conor McGregor’s post from Twitter below. Conor McGregor has not stepped foot inside the cage since suffering a fourth-round submission loss to the aforementioned Khabib Nurmagomedov at UFC 229. The Irish star recently announced his retirement from the sport of mixed martial arts. It marked the second time that Conor has “retired”. With that said, UFC President Dana White is confident that he can get come to terms with McGregor, which would see the former “champ champ” return to action before years end. While “Mystic Mac” May very well be lured back into the octagon, he currently has some battles to take care of outside of MMA. McGregor was arrested last month in Miami for strong armed robbery, and now finds himself up against sexual assault allegations in Ireland. 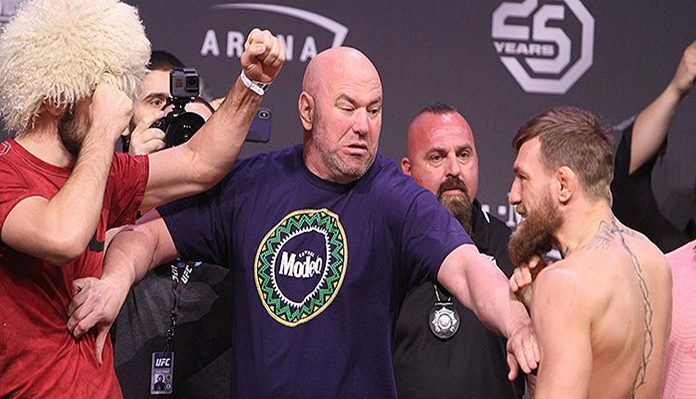 What do you think of Conor McGregor’s latest jab at Khabib Nurmagomedov? Sound off in the comments section PENN Nation!